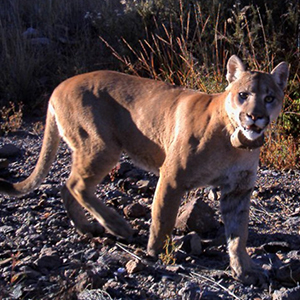 The Furman Cougar Project began in 2008 as an effort to monitor and research cougars in south-central New Mexico. Each summer Furman University Biology professor, Dr. Travis Perry, and his students travel to Sierra County New Mexico to photograph and track the large wild cats. The research team sets up a grid of cameras in key locations that are programmed to snap a photograph of any movement. The cameras help the team identify potential locations of the cougars. When a cougar’s location is identified, the team then safely captures, tags, and collars it with a GPS locator. In this way, they are able to track the movements and hunting patterns of the cougars. This digital collection contains more than just photographs of cougars, however. Because the cameras are set to photograph every movement, there are pictures of a wide assortment of wildlife. Everything from skunks, to bears, to bats appear in the digital collection.